As manager Cito Gaston promised, right fielder Alex Rios was back in the Blue Jays’ starting lineup for Tuesday’s tilt against Tampa Bay. For the second time in the past week, Gaston slid Rios down into the seventh spot of the batting order. Gaston was asked if, at the beginning of the season, someone told him Rios would be hitting seventh before the All-Star break, what would the manager’s reaction be? Overall, Rios entered Tuesday batting .263 with nine home runs and 37 RBIs through 76 games for the Blue Jays this season. He opened the year as Toronto’s No. 3 hitter for 61 games before being moved down to the sixth hole for 14 contests. Over his last eight games, Rios has hit just .188. Gaston still believes the talent is in there. That’s been the story year in and year out with Rios. Loads of potential, flashes of his raw ability in spurts, but prolonged slumps during which he can look completely lost at the plate. As he has stated numerous times before, Gaston said he believes timing is the root of Rios’ issues at the plate. “I still believe a lot of times he’s not ready,” Gaston said. “I say this all the time, guys when they don’t hit well they just don’t get ready in time. Also, you have to have an approach up there, too. You can’t hit every pitch that they throw up there. You’ve got to have a plan about what you want to do. OTHER ITEMS: On Tuesday, closer Scott Downs (sprained toe on his left foot) threw off a mound in a bullpen session for the first time since injurying his foot on June 16. Downs said the session went well, and the injury hasn’t negatively affected his mechanics, but he has yet to test his foot with running. That step will come in he next few days. Downs said he hopes to be ready to return during the coming road trip, maybe even as early as Friday, when he’s eligible to be activated. Gaston said the club might be more cautious, possibly giving Downs until after the All-Star break. 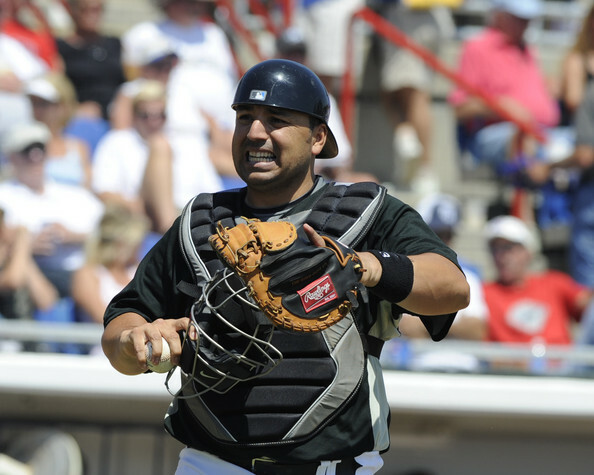 … Catcher Rod Barajas, who has been dealing with a sore right hamstring, was out of the lineup on Tuesday. Gaston said Barajas and catcher Raul Chavez will alternate starts for the time being. … Jays draft pick Jake Eliopoulos (68th overall) from nearby Newmarket, Ontario, visited Rogers Centre and threw in the bullpen on Tuesday. He remains unsigned. … If you have any Jays questions, send them with your name and hometown to bluejaysmailbag@gmail.com. Thinking of rolling out a mailbag on Thursday, if I get enough quality Q’s from the fanbase. It’s just a “day off” for Alex Rios, says manager Cito Gaston. Nothing more to it than that — just a way to get Jose Bautista “a few at-bats.” Maybe so, but there is no arguing that it is a well-timed day off for Rios, who has been frustratingly streaky this season. 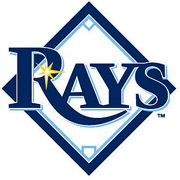 Rios, whose last day off came on May 26, has hit a paltry .188 with no homers and four RBIs over his last eight games. That comes after a 13-game stretch during which he batted .321 with two homers and seven RBIs for the Jays. Asked what he’s been seeing at the plate from Rios, Gaston stuck to his usual explanation. DOWNS WATCH: Spoke briefly with Jays injured closer Scott Downs this afternoon, between his moving the “No Media Beyond This Point” sign and finding the “Red Bull spot” for his can in the dugout routine. Downs (DL’d with a sprained toe on his left foot) said his foot feels “the best it’s ever felt” and he plans on testing it out a mound and during some fielding drills on Tuesday. He’s eligible to come off the DL for the Jays upcoming series in New York. Not sure if he’ll be ready by then. ROD READY: Catcher Rod Barajas (sore right hamstring) convinced the Jays to change their lineup on Monday with some successful baserunning prior to the game against the Rays. Barajas has avoided the DL and is back behind the plate. Gaston admitted that having Doc Halladay on the mound Monday played a role in starting Barajas. The catcher has been behind the dish for each of Doc’s 14 starts this season, and the ace has gone 10-1 with a 2.53 ERA. Why mess with a good thing? HOME RUN HILL: Chatted some with Jays second baseman Aaron Hill this afternoon about where all the power is coming from. He talked about his swing mechanics and also noted that his bat is 1.5 ounces heavier this year. Check bluejays.com later tonight or tomorrow morning for more. … A good story he also shared: Hill set his high school’s record for homers with nine back in 2000 at Redwood High in Visalia, Calif. Earlier this season, Redwood player Blake Proctor broke Hill’s mark. Hill found out from one of his old teammates, Redwood coach Mario Celillo, and decided to call Proctor to congratulate him. Nice move. Just another reason to like this Aaron Hill fellow. I never got a call when I broke my high school’s record for being hit by the pitch. No love. TOUGH STRETCH: After bolting out of the gates this season, the Blue Jays have fallen back to earth. The Red Sox, Yankees and Rays are all now ahead of the Jays in the American League East standings, and Toronto’s next 16 games (10 on the road) are all against division rivals. Funny story. So, you know how the Blue Jays announced that Rod Barajas was going to be placed on the disabled list last night? Yeah, well, see, it turns out that Rod felt much better this morning, so Toronto went ahead and pulled the plug on that move. So all that stuff about Kyle Phillips being called up from Triple-A and Shaun Marcum being moved to the 60-day DL to clear room on the roster? Yeah, just kidding. That’s all voided. The Jays never filed the paperwork with the league, so the roster remains as is. Raul Chavez will serve as the starter behind the plate for now and Barajas is available, if needed. If the strained right hammy continues to act up, the Jays will then place him on the DL. For now, he’s day-to-day and the club is in a wait-and-see mode. Phillips did catch a flight from Las Vegas and I’m guessing the team will have him hang out in Toronto for a few days while the club sees how Barajas recovers. Hopefully Phillips can at least get some air miles out of all of this. In other news, Johnny Mac is in the lineup! Starting at third base in order to give Scott Rolen a day off. It’s McDonald’s first start at third since April 20 of last season, when Rolen was on the DL. FROM THE WOW DEPT: In the first inning on Saturday afternoon, Jayson Werth sent a 2-2 offering from rookie lefty Brad Mills to the first row of the 500 level seats high above left field. That’s the first 500-level bomb I’ve seen since covering this team. The last came on Sept. 16, 2004, when Vernon Wells sent one up there. Blue Jays catcher Rod Barajas left Friday night’s game against the Phillies in the second inning with a strained right hamstring and was placed on the 15-day disabled list following Toronto’s 6-1 win. With Barajas sidelined, the Jays selected the contract of catcher Kyle Phillips from Triple-A Las Vegas. To clear room on the 40-man roster for Phillips, Toronto transferred injured starter Shaun Marcum (right elbow) to the 60-day DL. The Blue Jays will know more about the exent of Barajas’ injury on Saturday. With two outs, Barajas sent a 3-1 pitch from Phillies lefty Cole Hamels up the middle for a single. After reaching first base, Barajas called for time, walked off the bag and was quickly met by Jays manager Cito Gaston and head trainer George Poulis. Barajas jogged a few steps down the right-field line before deciding to head back to the clubhouse with Poulis. Backup catcher Raul Chavez entered the game as a pinch runner and remained behing the plate for the Jays. On Saturday, Barajas was given a day off against the Nationals during a night game in Washington. Gaston said the veteran catcher was dealing with a sore hamstring and was in need of some rest. Barajas played on Sunday and started in each of Toronto’s three games against the Reds in Toronto earlier this week. Barajas has appeared in 62 of the Blue Jays’ 74 games this season, often receiving a day off on a day game following a night game. Entering Friday’s game against Philadelphia, Barajas was hitting .263 with seven home runs and 37 RBIs. The Blue Jays also had replacement options at Triple-A in veteran Michael Barrett and prospect J.P. Arencibia. 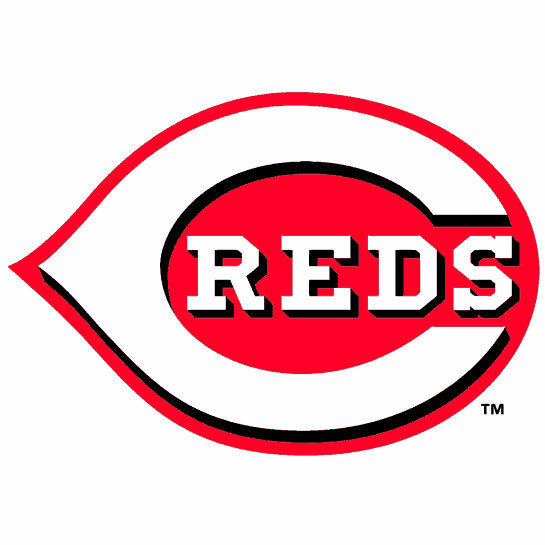 Barrett is currently rehabbing from a right shoulder injury he suffered in April and needs more at-bats before returning to Toronto, according to general manager J.P. Ricciardi. Ricciardi added that Arencibia needs to continue playing every day with Vegas. Barrett recently joined Vegas and has hit .308 in three games with Vegas after playing three games with Class A Dunedin. Arencibia is Toronto’s top catching prospect, but has hit just .227 with eight homers and 37 RBIs in 64 games for Las Vegas. In 51 games between stints with Double-A New Hampshire and Vegas this year, Phillips has hit .302 with four homers and 13 RBIs. Phillips, 25, is the younger brother of former big-league catcher Jason Phillips, who also played for the Blue Jays from 2006-07. Praise the Baseball Gods Blue Jays fans, your prayers have been answered. The good doctor, Harry Leroy Halladay, is ready to rejoin Toronto’s rotation. Come Monday, Doc will be toeing the rubber at the dome against those pesky Rays. Halladay threw in a 50-plus pitch bullpen session today and worked through all of his pitches. Afterwards, Doc declared himself healthy and ready to go. He said that mild groin strain was “completely gone” and he didn’t see why he wouldn’t be able to activated from the 15-day disabled list for Monday’s start. Asked Halladay whether this injury might influence his decision to pitch in the All-Star Game, and he said it’s too early to make a call on that. For what it’s worth, Blue Jays manager Cito Gaston said he won’t hold Halladay back in any way if he’s asked to pitch, or even start, in the ASG in St. Louis. “I would never do that,” Gaston said. “I think that it’s quite an honor to be picked or play in an All-Star Game. It’ll certainly be all up to Doc. If he didn’t want to go, that would be his choice. It certainly wouldn’t be mine. I can’t see anyway that he’s going to get around not going to the All-Star Game. As for those wounded relievers, Gaston said Jeremy Accardo (groin) is ready to pitch again, but lefty Scott Downs (sprained toe on his left foot) has nothing new to report. Accardo threw off the mound prior to Friday’s game and Downs threw in a long toss session on flat ground. There is still no established timetable for Downs’ return, though. In the clubhouse, the Michael Jackson (RIP) tunes were blaring this afternoon. Marco Scutaro easily had the best moves of the players, busting out some nice footwork and a few crotch grabs during “Beat It”. Aaron Hill did part of the “Thriller” dance when that song came on. Quality entertainment. It’s funny how taking just two days off away from the team can leave a beat reporter feeling a bit lost. Sure, it’s only been two days, but you walk in and you feel like you have no clue about what’s been going on. Takes a minute or two to catch yourself up. It was a lovely little break, though. Went on a belated anniversary dinner date with the Wife — headed up to the 360 revolving restaurant at the top of the CN Tower and had a great time. But, now, it’s back to the presbox and back to covering the Fightin’ Jays. The only real news item to emerge from today’s relaxed pregame chat with manager Cito Gaston was that the team should know more about ace Roy Halladay’s status on Friday. Doc is scheduled to throw in a bullpen session to test that sore groin, and the Jays will decide if he’s able to start on Monday. If Halladay isn’t able to come off the disabled list for that outing, Scott Richmond would likely get the nod. “Let’s hope it’s Doc — nothing against Richmond,” Gaston said. In the bullpen, the Blue Jays are without the services of righty Jeremy Accardo for tonight’s game — another groin tweak. The team is giving him another day off to see if he’ll be fine in time for this weekend, hoping that sending Accardo to the DL won’t be necessary. I am off for the next two days, so the Blue Jays beat will be in the hands of Erika Gilbert for the first two games of this Interleague set against the Reds at the Rogers Centre. The blog will be quiet until I return to the pressbox on Thursday. You can still follow my updates on Twitter. Find me under @MLBastian. Happy Father’s Day to all the dad’s out there today. For me, it’s a happy Father-to-be Day, seeing as the Wife and I are expecting our first at the end of August. Kind of strange thinking that I’ve got a son of my own on the way now. That’s me and my dad pictured on the right. We were at a parade and this shot actually wound up in the newspaper. I grew up with a dad who was a bit older than my friends’ fathers — he was 41 when I was born — but he always did his best to keep up with me as I got older. I remember going out to the park behind our house and playing catch when I was still playing ball, and it got to the point where the ol’ man couldn’t get the ball to me on a fly when I’d be doing long toss. But, to his credit, he went out there and one-hopped throws to me as long as I needed to be out there. I always thank my dad for giving me great advice when it came time to head off to college. It was either head to a Christian College in Illinois where I could still play ball, or head to the much larger Michigan State University. He told me to do what felt right to me, not to do what I thought other people wanted me to do. The Jays have reordered their rotation for after Monday’s off-day. Brian Tallet, who threw just 76 pitches in five innings on Friday night, will pitch on short rest on Tuesday at home against the Reds. He’ll be followed by Scott Richmond, who worked one-plus innings in relief last night, on Wednesday and Brett Cecil on Thursday. For now, young Brad Mills will be moved into the bullpen. Toronto doesn’t need a fifth starter until next Saturay (6/27) and ace Roy Halladay (strained right groin) is eligible to come off the disabled list on 6/28. With another off-day on Thursday, July 2, Halladay — if he returns when eligible — would be in line to start the opener of a series in New York on July 3. Halladay is scheduled to throw off a mound on Tuesday. Also, chatted with Russ Adams today, check out bluejays.com later for that story. And, after having the day off due to a sore hamstring on Saturday, catcher Rod Barajas is back in the lineup today for the Blue Jays. It’s like that famous blurry picture of bigfoot. Just who exactly did I see on the south lawn of the White House this afternoon? After running into the Star’s Morgan Campbell at the President’s house, police began to very forcefully clear the sidewalk on the north side of the street. This sometimes means someone is coming out of the big white building, so I hung around to see what was what. Well, someone in an orange shirt and khaki shorts came out shortly after a black SUV — probably security — rolled up. People thought they saw the Obama’s dog being walked, and everyone started screaming thinking it was Mr. Obama himself. Upon closer inspection of the photo I snapped very quickly, it looks more like the First Lady if it even is one of the Obama family. It’s probably just a hired dog walker. Who knows? I’m sticking with my story. I saw one of the Obamas today and that’s all there is to it. I also checked out the Newseum (great!) and walked from there to the Washington monument, Vietnam memorial, Lincoln memorial and headed back down the Capitol to take some photos. The lineup card had an odd sight for tonight’s game. Catcher Raul Chavez was starting in place of Rod Barajas. This is often the case for day game’s after night games, but Saturday’s contest in D.C. was a night game as well. Manager Cito Gaston said Barajas has a sore hamstring and might be fine to play on Sunday. After using 13 relievers in the past two games, Gaston’s bullpen is a little thin tonight behind rookie starter Brett Cecil. The only available arms are Shawn Camp, B.J. Ryan and Dirk Hayhurst (Gee, who’s the closer?). If Cito needs more arms, he said starters Brad Mills and Scott Richmond are emergency options. Gaston was asked if — to help the bullpen situation — the team considered calling someone up from Triple-A Las Vegas, just to have an extra arm on hand. 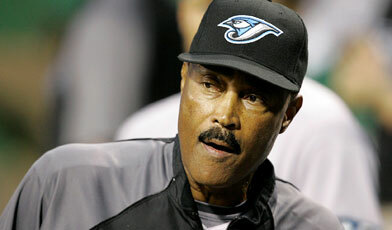 Anyone wondering why Blue Jays manager Cito Gaston didn’t utilize the double switch in the eighth inning of Thursday’s win over the Phillies will be relieved to know there is a simple explanation. “As soon as I got out there, I realized I screwed it up,” Gaston admitted on Friday. The Jays were clinging to a 7-6 lead and Gaston headed to the mound with two outs and a runner on second base to remove pitcher Brandon League. Due to lead off the top of the ninth was the pitcher’s spot for the Jays. The eighth spot of the order was occupied by catcher Raul Chavez and catcher Rod Barajas and infielder John McDonald were left on the bench. Remaining in the bullpen were Jason Frasor, a struggling B.J. Ryan and a jet-lagged Jeremy Accardo. Gaston was turning to Frasor to face Shane Victorino, and using the double switch would have put the Jays reliever in the 8th hitting hole and brought Barajas in behind the plate and also set to lead off the ninth. Where Gaston messed up was in walking straight to the mound and not consulting with the home-plate umpire. In the end, everything turned out OK. Frasor allowed a single to tie the game, but Chavez threw out Shane Victorino on a stolen base attempt and Barajas — used as a pinch-hitter in the ninth — belted a solo home run to send Toronto to a 8-7 win. Despite his error, Gaston came away smelling like roses. It was apparent that Gaston realized his mistake when he got to the mound. Once there, he turned back to the dugout and made a hand motion toward the dugout, pounding his fist in an open hand — signaling for the catcher. Someone in the dugout alerted him that the double switch had to be called off, though. Managing primarily American League games is one reason the procedure slipped Gaston’s mind for a brief moment. It could have been a costly mistake and it’s just one more reason the manager believes the DH should be a part of Interleague Play.